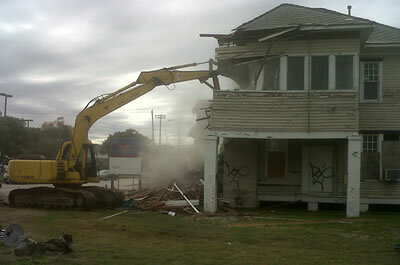 Demolishing a residence can be done with sledgehammer and lots of time; or it can be done with a few front-end loaders and a bulldozer in a day. When you call on JRP Services, you’re calling on a company that’s got the right tools to make your tear-down easy. Plus, we take care of clean-up, and we can provide landscape grading services while we’re on site. So whether you’re looking at a complete tear down or a more simple home renovation project, call the residential demolition professionals at JRP Services. We are Houston, Texas’ leading demolition company, and we’re committed to providing carefully planned and perfectly executed demolitions. Contact us today to learn more about our services, and get your free estimate now!